Find practical advice on how to design your office at work and at home according to feng shui principles by watching videos created by experts and practitioners. You can address such issues as cubicle office configuration challenges, home office feng shui, desk placement, advancement in your career, and general feng shui tips for any office. These two videos give you some very practical advice and remedies to common problems found in the western style of cubicle configuration. These designs typically mean you sit with your back to the opening of your cubicle. Deanna Radaj with Bante Design, LLC created this video and starts by showing viewers a cubicle office that breaks feng shui principles. The employee must sit with her back to the door, opening herself up to back-stabbing and constantly being startled by activity taking place behind her and out of sight. The second cubicle is an excellent example of how feng shui can be both practical and attractive in changing the way you work. This feng shui cubicle allows the employee the ability to see everyone who passes her cubicle, so there's never any startled responses or surprises. Radaj goes into details to explain what doesn't or does work in each office space according to feng shui principles. This video addresses the feng shui challenges of working in a cubicle. Often the configuration of a cubicle is permanent. Since you cannot change this, use feng shui to remedy any aspects that are inauspicious for your work and career. In this example, feng shui expert Leigh Kubin assists a technical writer and department manager with his cubicle design. His goals are to make his team feel valued and that he is accessible. He also wishes to convey a sense of informal ambiance. Leigh addresses some problematic areas in the cubicle and provides not only cures, but the reason why these are the solutions to the various challenges of his office design. These two videos offer some great tips for home office feng shui. The first video takes the viewer through the home office of a best selling author. The second video gives a wealth of information and tips on how to make your home office a professional feng shui space. Leigh Kubin with Feng Shui Your Way takes on a new client, international bestselling self-help author Joe Vitale. The first thing Kubin advises Vitale to do is state his immediate goals. By listing and stating your goals, you can then design your office space to assist you in manifesting those desires. Desire to reach more readers worldwide: Place a map in the helpful people section of the office. Have a residual passive income of $25 million per month: Print out this goal and place in wealth corner of office. In addition, Vitale's office is very cluttered, especially with stacks of books. Kubin helps him to declutter and understand why his revamped office feels cleaner and lighter after the feng shui overhaul. Like so many office desk placements, Vitale sits with his back to the door. Kubin places a small round mirror on his monitor so he can now see anyone who comes up behind him. This is significant in preventing him from being blindsided at work and in his career. One last touch is a small rug or runner that serves to break up the fast flow of chi into his office. The rug forces the chi to disperse and circulate throughout the room. Feng shui expert Carol Hyder gives valuable tips on home office feng shui. She comments that too many people don't treat their home offices as professional work spaces. This is a big mistake, especially when it comes to feng shui principles. Her approach is to guide her clients to rethink what a home office should be. 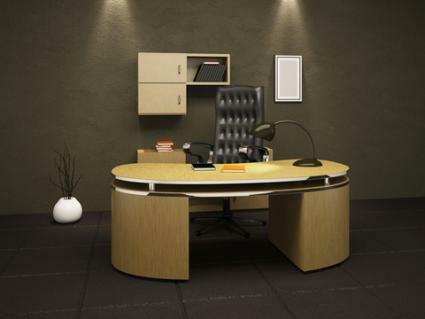 She advises that close attention be paid to purchasing a professional desk and to have ample storage. When converting a bedroom into an office space, Hyder tells clients to make it look not like a bedroom but a true office. She believes this will drastically alter your psychological impression of your work and will directly affect your career in an auspicious way. This video is an excellent example of transforming a former bedroom space into an office space. It also addresses the challenges of working feng shui principles into a small design budget. Nicolette Vajtay of Inspired Living Feng Shui walks her client, Tammi, through a short interview to assess her office needs. It's important that your feng shui practitioner understands your goals and what you wish to achieve with your work space or business. This information helps practitioners determine the best ways to activate auspicious chi energy to assist you in achieving your goals. The video resumes after the women have shopped for the new furniture and shows how Vajtay sets up the office space. She walks the viewer through the reasons for each item placement. Chriss Barr discusses how to use a water feature to boost your career. Ken Lauher shares feng shui Black Hat Sect desk and office placements principles. Feng Shui Room Design gives an overall dos and don'ts for home offices. Ken Lauher is back to discuss how the shape and size of your desk is important in feng shui design. Chriss Barr returns to discuss how you can use the bagua for your office feng shui. Feng shui experts offer excellent advice for the feng shui novice and seasoned feng shui aficionado in helpful video demonstrations. However, anyone can make and upload a video onto YouTube. Be sure to check out the credentials of others giving feng shui advice. Once you assess the validity of the person's knowledge, you can then judge if the advice is something you want to incorporate into your feng shui office makeover.